Today's skin care post is actually a post that I shared almost two years ago but decided it was a good one to bring back. I receive more skin care question e-mails than I am able to respond to at times. Some of you want to know why you constantly have dark circles, why you are always breaking out on your chin or what you can do about those pesky forehead lines. I am hoping this will give you a little more insight. Your skin is constantly communicating with you and if you are experiencing pigmentation problems, acne, puffy eyes and other issues it is most likely the result of something deeper that is happening on the inside. Face mapping has been used for thousands of years in traditional Chinese medicine. The Chinese believe that you can tell a lot about a person and their health just by looking at their skin. I use this technique when I am doing a skin analysis on a client and it is so interesting how accurate it really is. 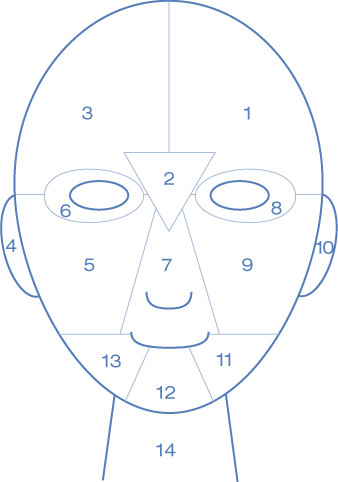 Listed below are the different zones of your face and what organ they are related to. Hopefully this gives you a better understanding of what exactly may be causing your skin care concerns. Forehead (Zone 1 & 3)- This zone is related to the bladder and digestive system. If you have deep lines this could indicate a blocked colon and or gallbladder. If you are experiencing breakouts here it could indicate that you are having a few too many cocktails and your diet may be a little too rich in dairy or processed foods. You should try drinking more water and eating more natural foods. Between eyes (Zone 2)- This zone is related to the liver. Breaking our here may indicate you have a food allergy and are consuming too many rich or fried foods. Ears (Zone 4 & 10)- This zone is related to the kidneys. It is pretty rare to breakout on your ears but if you do you need to give your kidneys a little more TLC. You should drink more water and cut back on alcohol. Around your eyes (Zone 6 & 8)- This zone is also related to your kidneys. If you are experiencing dark under eye circles or puffiness this can indicate you are stressed, drinking too much caffeine and you not getting enough sleep. Cheeks (Zones 5 & 9)- This zone is related to your heart and respiratory system. I can usually tell if a client is a smoker or used to be a smoker by the little broken capillaries that show up along the cheeks. Also if you are eating too much protein or fatty foods you may experience breakouts here. Nose and upper lip (Zone 7)- This zone is related to the stomach and intestines. Deep lip lines may indicate that you are not properly digesting your food. If you are experiencing breakouts here you may have a food allergy. Quick little fact....I ALWAYS breakout on my nose (worse place right?) whenever I eat a large amount of peanuts or peanut butter. Chin and jaw ares (Zone 11, 12,13 & 14)- If you are experiencing breakouts or pigmentation problems here is it most likely due to a hormonal imbalance. If you are experiencing any of the above problems with your skin, take a look at your lifestyle and if you need to tweak a few things there is no doubt your skin will thank you for it. This is so helpful, and interesting! I usually have issues in zone 2, and now I know why! Wow...this is so interesting! I'm pinning it, so I can refer back to it often. Thanks so much! I have been into Chinese Medicine, and my Chinese Doctor told me - and showed me evidence in books etc - that what you have labelled as 11, 12 and 13 is the digestive system, stomach, intestine, etc. It proved right with my gastritis, I used to have perfect skin but once the gastritis came, the pimples came in exact those areas. Great tips! I had never really put two and two together before. But, there is that old say, "you are what you eat". Girl Ive been breaking out on my cheeks like crazy. And I eat alot of nuts as healthy snacks. Ive got to cut back... GREAT tips! Thank you for posting this! This could not have come at a better time, my skin has been acting so weird this past week! And I can definitely see how what I've been eating has had an effect! This a great post! Very helpful. It's good to teach people that "it is not just acne" but to look at the body and what is going on inside and what you are consuming. I studied Ayurveda for many years and how the face grid is helpful or looking at the tongue. Thanks so much for sharing! I have been breaking out on the chin every once in a while for the last year or so.... other factors are pointing to the beginning of menopause. I get my hormones checked next week. I was interested to read this because for the most part I have clear skin... except when I get my period - I break out on my chin! So hormonal imbalance. Hmm food for thought. I have been trying to give my hormones extra attention for the past 2 years, on my own, as my doctors think I am fine, and still do. I have TERRIBLE periods but it's work in progress. I am big into herbs/Chinese medicine. Interesting post! I read your original post a long time ago, so when I was having a hard time with my skin, I looked this face map up again. I cut out one simple thing...no more drinking milk with dinner and all of a sudden, my skin has cleared up.I am a big fan of that! I am so thankful to you for this information and this blog! :) -Melissa W.
Broken capilliaries on the cheeks aren't necessarily that of a smoker or former smoker. I have broken capilliaries and have never smoked in my life. I do have rosacea, and I expect that the broken capilliaries are due to exposure to extreme heat and cold as I worked outdoors for a majority of my career. This is interesting. I always have at least a couple pimples on my chin (zone 11 and 13) and I've been experimenting for years trying to figure out how to clear it completely. Hormonal, yes, I'm hearing that. BUT... what do I do about it?? My teen daughter has been frustrated with acne on her back and a little on her chest. She is very involved with dance; could it be the perspiration? Any insight you can give on "backne" would be appreciated! This is so interesting because whenever I've been pregnant I always have issues around my jaw line. I just can't get over the fact that you posted this TWO years ago. Where the heck did that time go?! Oh I remember when you shared this and have referred back to it often! In the past year my problem area has been my cheeks and I can agree I haven't had the best diet in the past 12 months!